Click on the photo to see ThurstonTalk’s story about the Comcast Foundation grant to the Boys & Girls Clubs of Thurston County. Grants help expand digital literacy, promote community service and build youth leadership skills. 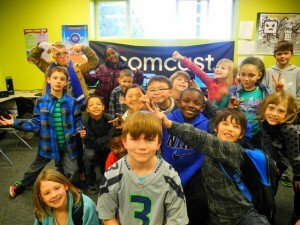 Boys & Girls Clubs of Thurston County and the Comcast Foundation announced today that a $20,000 grant to Boys & Girls Clubs of Thurston County is already being used to grow the Club Tech program that teaches youth about technology and their future in Olympia, Lacey, Tumwater and Rochester. Thanks to the grant, the Clubs will be able to offer programs to help equip its members to become tech savvy and prepared for an ever-changing digital world. The grant helped pay for dozens of cameras and computers as well as software and instructional time. Club Tech, a digital literacy program, aims to make technology accessible, intriguing and fun. Through the Club Tech suite of programs, kids learn how to use basic business software, as well as advanced hardware and networking skills, and, most importantly, how to be safe online. The Comcast Foundation has donated nearly $17 million in 2013 to nonprofit organizations in the communities it serves. Since 1999, the Comcast Foundation has donated nearly $140 million. Comcast also donated more than $30,000 worth of airtime in 2013 to raise awareness of Boys & Girls Clubs of Thurston County through a PSA. In addition to the grants from the Comcast Foundation, Comcast also responds to community needs through local sponsorships and in-kind support, such as airing public service announcements, employee volunteerism and providing technology equipment and services to organizations across the country. In Washington State in 2013, Comcast donated nearly $4 million in grants and in-kind services to more than 300 organizations. For these and other community efforts, Comcast in 2013 was named one of the most community-minded companies in America by Bloomberg, the Points of Light Foundation and the National Conference on Citizenship. The Civic 50 is a comprehensive survey of S&P 500 companies that best use their time, talent, and resources to improve the quality of life in the communities where they do business. To learn more about Comcast’s community support, visit the Comcast Corporation website, explore and “like” us on Facebook or follow us on Twitter. The Comcast Foundation was founded by Comcast Corporation in June 1999 to provide charitable support to qualified nonprofit organizations. The Foundation primarily invests in programs intended to have a positive, sustainable impact on their communities. The Foundation has three community investment priorities—promoting community service, expanding digital literacy, and building tomorrow’s leaders. Since its inception, the Comcast Foundation has donated nearly $140 million to organizations in the communities nationwide that Comcast serves. More information about the Foundation and its programs is available at www.comcast.com/community.